26th Annual Brookings Car Show! The Brookings Car Show is an annual event put on by the Brookings Car Council. The second weekend in June has seen Brookings, SD, filled with hot rods and muscle cars since 1993. 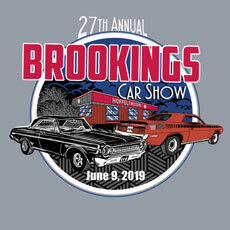 It is our 26th Annual Brookings Car Show this year. We have some activities that will be going on in downtown Brookings on Saturday along with the car show in Pioneer Park on Sunday. We will be having a Show-N-Shine event on Saturday from 10 AM to 3 PM around Nick’s Hamburger Shop at the corner of Main Avenue and 5th Street. A cruise will leave from Nick’s around 3 PM, and will end back at Nick’s where you can get something to eat, and enjoy more time with friends and fellow car enthusiasts. You can register for the Cruise at the Show-N-Shine in the afternoon. We are hoping to have another great turnout for the car show on Sunday in Pioneer Park. Everyone will have the opportunity to show off their prized ride by bringing your vehicle out to Pioneer Park to enter it in the judged car show, where we have had up to around 200 cars. Come out for the day and enjoy some casual viewing of cars and trucks in the 27 different classes we have to offer. The cars and trucks in each class will be competing for 1st, 2nd, and 3rd place awards, along with a Judge’s Choice Award, and there will be dash plaques for each entrant in the show. There will be several food vendors to choose from, and with the great collection of cars and trucks to view at the show, it will be an afternoon of fun for all in attendance to walk around and enjoy the cars and trucks on display and to grab something to eat. The registration for the car show on Sunday is 9 AM to 11:30 AM, with the car show going from 11:30 AM to 3:30 PM with the awards at 3:30 PM. For a list of the activities and times for the events for Saturday and Sunday, please also see the Schedule link for a listing of the times for the events. So, as you have been doing for the past years, get your classics out of the garage, clean them up if need be, and get them entered in the judged car show on Sunday. Help us beat our record and make this our best turnout ever! A cruise will leave from Nick’s at 3 PM. Register at the Show-N-Shine downtown prior to departure. Car Show: 11:30 AM to 3:30 PM at Pioneer Park. Tunes, prizes, and food vendors. There will be $25 cash drawings every half hour for car show participants, starting at 12:00 noon until the awards at 3:30 PM.